Ok, made it back from Baxter safely. Kaps did all the driving, I did some sleeping. Unfortunately, right after the conference finished up, I got hit by that now-familiar feeling of malaise and grogginess. Lunch at Perkins helped a bit, made my own omelet out of pork and cheese products. Went home and took a nice 4-hr nap with the wife, darnit if we didn’t miss that bed. The Recipe for tomorrow’s dinner. 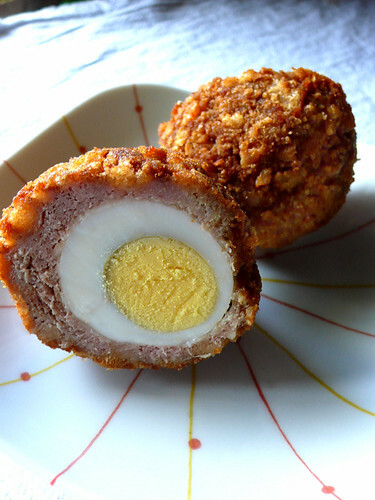 WTF is a scotch egg? Why the heck not, a video of it too. ~ by thecox on May 21, 2007. What’s the deal with Te Hooligan?